In this simulation, a gas filament condenses and then fragments to form the first stars. The blue shading in this image reflects changes in the gasâ€™ density. Dark matter is a mysterious substance scientists think accounts for most of the mass in the universe but that is invisible to current instruments. Theorists figure that in the universe's infancy, dark matter served as a gravitational rallying point around which normal matter—hydrogen, helium and lithium—gathered. 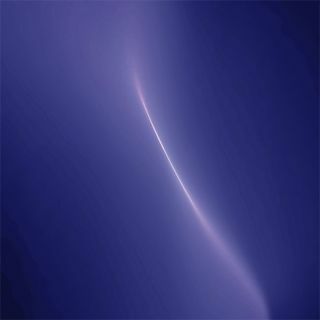 These gases coalesced into the first stars, bringing light to the universe and ending the short-lived cosmic dark ages. Meanwhile, researchers have been trying to figure out if dark matter is "cold" or "warm." A star-formation model, detailed in the Sept. 14 issue of Science, suggests a way that scientists can choose between the two options.. A third "hot" dark matter model has already been ruled out. The research could also lead to more accurate estimates of how long after the theoretical Big Bang that the first stars began to shine and help explain how the most massive black holes form. Dark matter's gravity anchored the first stars in place so they could form, but its energy affected how and where those stars were born, the new thinking goes. A popular candidate for dark matter is a relatively heavy particle known as the neutralino. The invisible particle would move slowly because of its heft so, borrowing the terminology of thermodynamics, scientists call it cold dark matter or CDM. "'Cold' is a way of saying the particles have velocities that are slow compared to the speed of light," explained Volker Bromm, an astronomer at the University of Texas who was not involved in the study. According to CDM models, dark matter would have spread across the universe in ripples, collapsing in small, nearly spherical structures and creating "wells" that drew in gases to form stars. As a result, the first stars would have been born in litters. An alternative idea is that dark matter particles are very light and can zip through space more quickly. These warm dark matter models predict that instead of wells, dark matter formed long filamentary structures along which stars appeared like pearls on a string. "The filaments would have been about 9,000 light-years long, which is about a quarter the size of the Milky Way," said study team member Liang Gao, of Durham University. A "hot" dark matter model was popular for a while, but has been ruled out by observations. "If you have hot particles, they would move very rapidly, at the speed of light basically, and the universe would look very different," Bromm told SPACE.com. According to the CDM model, primordial stars were behemoths with masses of around 100 times that of the sun. They would have blazed brighter and faster than their descendents. As a result, they would have burned out long ago and none would exist today. In contrast, the warm dark matter scenario predicts that the first stars averaged only 10 solar masses, and that some might have been even smaller. The lower a star's mass is, the longer its lifetime. While giant stars from the CDM model would be long gone, some of the stellar runts predicted by the warm dark matter model might still be blazing away today and could be detected by future space telescopes. "For a star to survive from the beginning of the universe to now, it would need to have a mass of one solar mass or less," Bromm said. If scientists can find some of those stellar firstborns, it would support the warm dark matter model. "If the dark matter is warm, some of these primordial stars should be lurking around our galaxy," said study team member Tom Theuns, also of Durham University. The warm dark matter scenario might also explain the creation of supermassive black holes, thought to lie at the heart of many, if not all, large galaxies. These monster black holes weigh up to a billion solar masses, and would have required massive seeds to grow. According to the warm dark matter model, a string of stars could collapse, causing the stars to collide in a cosmic mashup that would create a seed large enough to grow a supermassive black hole. In the alternative cold dark matter model, huge stars would not by themselves provide enough material to create supermassive black holes, and current theory can't fully explain how the gargantuan black holes came to be. Bromm thinks the new star formation model is valuable because it shows that the smallest particles in the universe can have a big impact on its large-scale structure. To see evidence for this, however, scientists have to go back to the very early universe. Both the cold and warm dark matter models paint roughly the same picture of the universe that we see today, with the same number and distribution of galaxies and stars. "You have to really go to the early universe, to the end of the dark ages, for [elementary particles] to matter," Bromm said. "If you go to the first steps in the buildup of cosmic structures, then cosmology reacts to the microphysics of particles, which is quite remarkable."